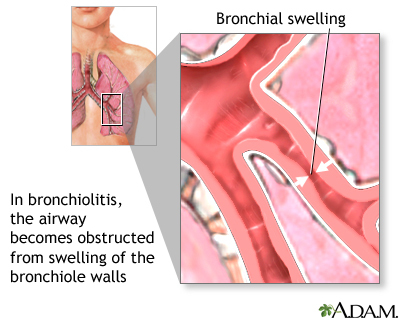 Bronchiolitis is swelling and mucus buildup in the smallest air passages in the lungs (bronchioles). It is usually due to a viral infection. Bronchiolitis usually affects children under the age of 2, with a peak age of 3 to 6 months. It is a common, and sometimes severe illness. Respiratory syncytial virus (RSV) is the most common cause. More than half of all infants are exposed to this virus by their first birthday. Bronchiolitis occurs more often in the fall and winter than other times of the year. It is a very common reason for infants to be hospitalized during winter and early spring. Some children have few or mild symptoms. Bronchiolitis begins as a mild upper respiratory infection. Within 2 to 3 days, the child develops more breathing problems, including wheezing and a cough. The health care provider will perform a physical exam. Wheezing and crackling sounds may be heard through the stethoscope. Most of the time, bronchiolitis can be diagnosed based on the symptoms and the exam. The main focus of treatment is to relieve symptoms, such as difficulty breathing and wheezing. Some children may need to stay in the hospital if their breathing problems do not improve after being observed in the clinic or emergency room. Antibiotics do not work against viral infections. Medicines that treat viruses may be used to treat very ill children. Have your child drink plenty of fluids. Breast milk or formula is fine for children younger than 12 months. Electrolyte drinks, such as Pedialyte, are also OK for infants. Have your child breathe moist (wet) air to help loosen sticky mucus. Use a humidifier to moisten the air. Give your child saline nose drops. Then use a nasal suction bulb to help relieve a stuffy nose. Be sure your child gets plenty of rest. Do not allow anyone to smoke in the house, car, or anywhere near your child. Children who are having trouble breathing may need to stay in the hospital. There, treatment may include oxygen therapy and fluids given through a vein (IV). Breathing often gets better by the third day and symptoms mostly clear within a week. In rare cases, pneumonia or more severe breathing problems develop. Some children may have problems with wheezing or asthma as they get older. Most cases of bronchiolitis cannot be prevented because the viruses that cause the infection are common in the environment. Careful hand washing, especially around infants, can help prevent the spread of viruses. A medicine called palivizumab (Synagis) that boosts the immune system may be recommended for certain children. Your child's doctor will let you know if this medicine is right for your child. Bower J, McBride JT. Bronchiolitis. In: Bennett JE, Dolin R, Blaser MJ, eds. Mandell, Douglas, and Bennett's Principles and Practice of Infectious Diseases, Updated Edition. 8th ed. Philadelphia, PA: Elsevier Saunders; 2015:chap 68. Coates BM, Camarda LE, Goodman DM. Wheezing, bronchiolitis, and bronchitis. In: Kliegman RM, Stanton BF, St Geme JW III, Schor NF, eds. Nelson Textbook of Pediatrics. 20th ed. Philadelphia, PA: Elsevier; 2016:chap 391. Ralston SL, Lieberthal AS, Meissner HC, et al, American Academy of Pediatrics. Clinical practice guideline: the diagnosis, management, and prevention of bronchiolitis. Pediatrics. 2014;134(5):e1474-e1502. PMID: 25349312 www.ncbi.nlm.nih.gov/pubmed/25349312. Updated by: Neil K. Kaneshiro, MD, MHA, Clinical Professor of Pediatrics, University of Washington School of Medicine, Seattle, WA. Also reviewed by David Zieve, MD, MHA, Medical Director, Brenda Conaway, Editorial Director, and the A.D.A.M. Editorial team.